Callaloo (sometimes calaloo or kallaloo) is a popular Caribbean dish originating in West Africa served in different variants across the Caribbean. The main ingredient is a leaf vegetable, traditionally either amaranth (known by many local names, including callaloo or bhaaji), taro or Xanthosoma. Both are known by many names, including callaloo, coco, tannia, bhaaji, or dasheen bush. Because the leaf vegetable used in some regions may be locally called “callaloo” or “callaloo bush”, some confusion can arise among the vegetables and with the dish itself. Outside of the Caribbean, water spinach is occasionally used. Trinidadians and Dominicans primarily use taro/dasheen bush for callaloo, although Dominicans also use water spinach. Jamaicans and Guyanese on the other hand use the name callaloo to refer to amaranth, and use it in a plethora of dishes and also a drink (‘callaloo juice’). The ‘callaloo’ made in Jamaica is different from the ‘callaloo’ made in Trinidad and Tobago in terms of main ingredient (the leaf used) and other ingredients included (for example, Jamaicans tend to use only callaloo leaf, salt, onions, and scallions, and simply steam the vegetable, while Trinidadians use okra and coconut milk to make a different dish with a different taste and consistency). 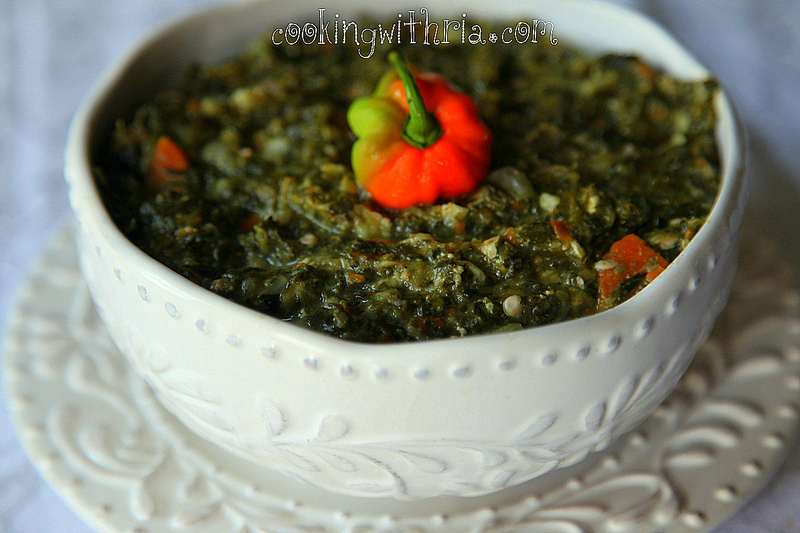 Callaloo is the National Dish of Trinidad and Tobago. I have included some recipes and a video from Caribbean Pot from YouTube. I hope you will enjoy visiting my blog and learning about foods from Trinidad and Tobago, and experiencing the flavours of the Caribbean.